The International Group of Ex Libris Users (IGeLU) is an association of customers of one or several products offered by ExLibris Ltd. This group meets once year to share user experiences as well as to hear about upcoming product developments. 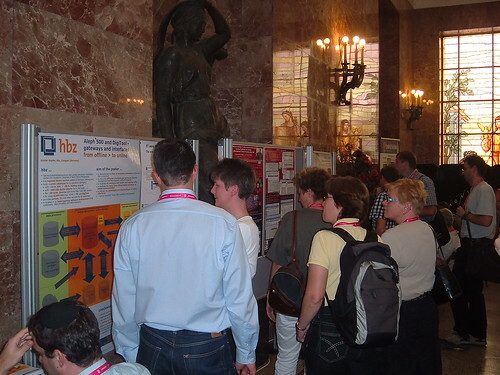 Between September 6-10, 2007 the 3rd IGeLU Conference has been hosted by the Spanish Council for Scientific Research in Madrid. Ex Libris took the chance to introduce its vision for the “next generation library system” which emphasis the decoupling of front-end interfaces from back-office services. While some effects of this strategic alignment became tangible over the course of the event (e.g. MetaLib will be re-implemented completely), many other fundamental questions remained open (e.g. who will be in control of the global data service layer?). My colleague Silvia Munding and I presented the integration of e-book holdings into the service menu of the MPG/SFX link resolver and spent the complete time to discuss motivation and details of our setup with the audience. Wow! We even ran out of handouts in the middle of the session, but the electronic version of the poster is deposited on the edoc server. Thanks a lot for your interest and all the helpful suggestions. Ex Libris embraces openness. […] In recent years, Oren Beit-Arie, chief strategy officer at Ex Libris, affirmed product openness as a strategic direction and one of the company’s core values and set the open-platform program in motion to transform the vision into a concrete plan.